If we can get the appropriate permissions, what are people's thoughts on using Grim's Senchal set as a base for Sutch? They have a nice verticality to them so I think they'd work well with the cliffside/dug in concept of Sutch, and if we use a mix of these and the Anvil-style buildings, I think the effect would be very striking. You really should check out the discord channel sometime - we talked about this a couple of days ago. I made a rough mockup of the site to see what kind of assets we would need. My current opinion is that Sutch architecture doesn't need a new tileset, apart from maybe a unique window or doorway asset (which we could prune from this set). The use of new tileset for every settlement is a real source of bloat, which I'd like to curtail. I don't really see a problem with using the anvil set for sutch, combined with the rural GC set for the lower city. However, we can keep the senchal set in data for a different purpose - khajiit culture around the Elsweyr border. 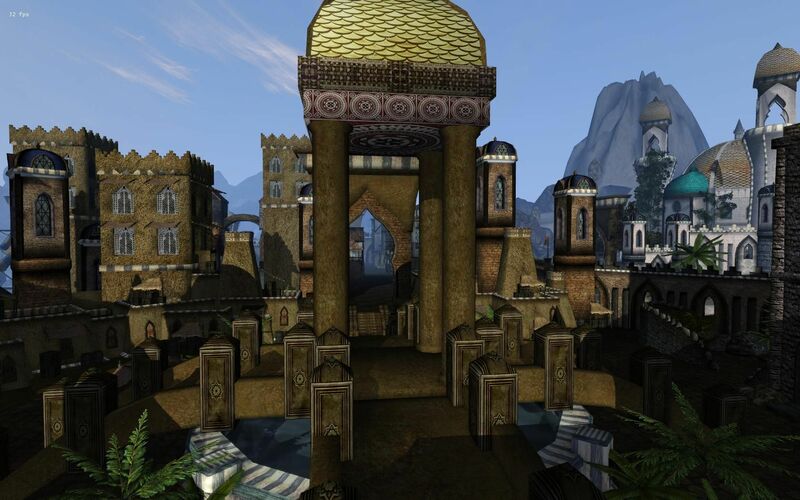 Starting from Skingrad, we can make sparing use of khajiiti stuff in the southern hinterland, and the Niben west bank is an area which belonged to Elsweyr until recently - most buildings here should be khajiiti. It's easy for me to say as I won't have to make the set, but Sutch is always described as a Redguard city controlled by Cyrodiil. It would be odd to have it use the Anvil set. If there were a Hammerfell project it would be easier to justify a new set as it could be used further afield in southern Hammerfell. 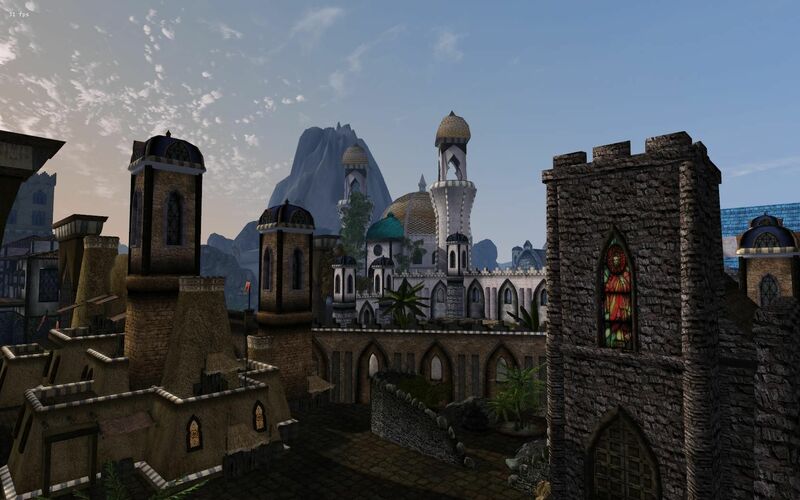 Generally, I agree with Infragris, however I think the situation is a little different when the city is explicitly described as having a strong non-Cyrodiilic influence - we can have a main style for each region, but I wouldn't expect Chorrol and Bruma to have the same architecture. I definitely think that we should use the Anvil houses as a base, but they absolutely should be augmented with new pieces that are clearly Redguard-inspired. The elevator and bridges would be my suggestion for those pieces - trying to jury-rig them from the existing sets looks a little funny in my opinion. I understand the logic of moving to mainly Discord for our communication, but man I hate it. There's not a single thing I like about chatrooms. I thought it had always been the plan to use a tileset with strong Redguard influences for the city, such as the assets Zackg had originally created, though I don't think he has ever finished or uploaded any of it. When it comes to the cities' design, we could easily get away with using the Anvil set, so if it's fine from a lore perspective I have no objections. Discord is fine for figuring out minor details in claims quickly, though more significant matters should preferably be discussed here on the forums; especially because we generally can't expect everyone to use Discord. I tried to create sutch walls set but Infragris said that no need too much stuff in already huge data, and I agree with them... but I so wanna sutch unicle and pics with placeholder in upper post showed that anvil stuff not very goot fit in this situation... also, I guessed Sutch is a little bit bigger. 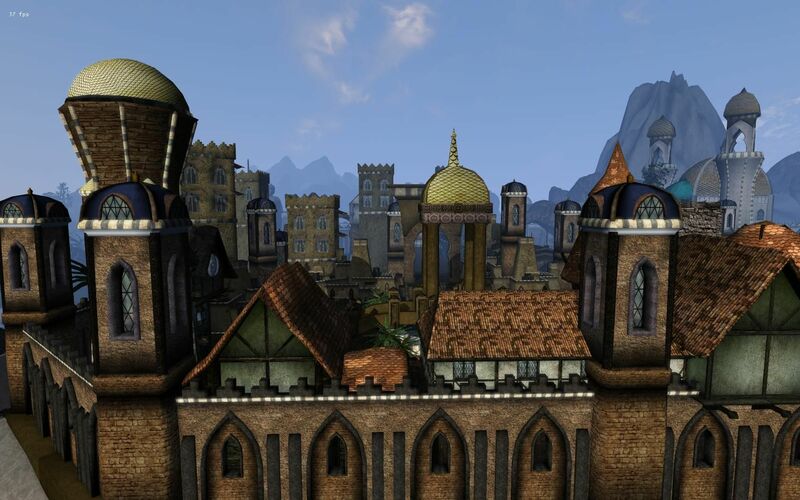 It's not so much a Redguard city that 's controlled by Cyrodiil as a city that changed hands between Hammerfell and Cyrodiil a dozen times or more. In fact, it has been under the control of Cyrodiil for the last hundred years. 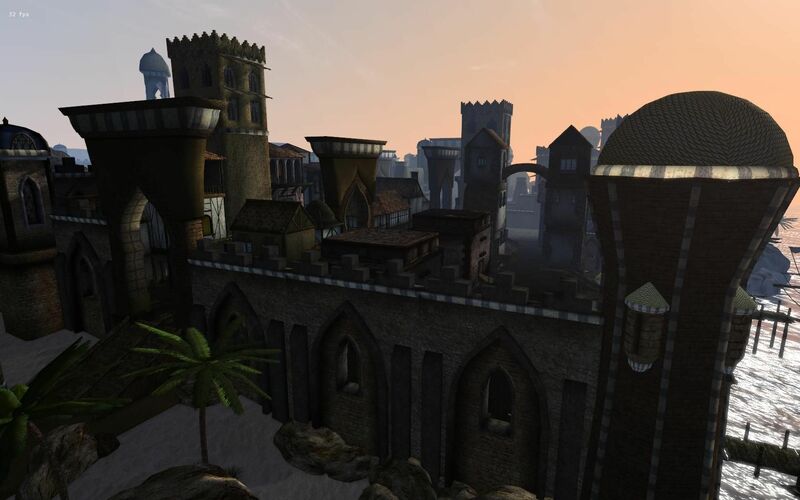 Any problems with the use of the anvil tileset can be explained away as cyrodiilic rebuilding following the destructive war against the usurper. Redguard influences should definitely show through in the design of the unique pieces needed for this city: the bridges, ascensor, and possibly a unique palace/manor mesh for the baron/governor/whatsit. The elevator will definitely require unique assets, as it cannot function otherwise. But in my opinion these pieces should be made from scratch, based on preliminary designs from the TR Hammerfell artbook. I should note that Sutch was never supposed to be a big city in my estimation - all design documents depict it as kind of a backwater, an outpost on the edge of the wilderness. Also, scale in the above pictures can be deceiving: the city as represented there would support something like 25 interiors: that's the size of Sadrith Mora, one of the base game's biggest cities. I agree with Infragris here, at least for practical reasons. Ideally we would have unique sets for each major city, but it isn't a necessity. The cities will each be unique in their own way. It sets an unlucky precedent when it comes to developing completely new sets in the future, and we're not exactly having a modeler surplus. It also isn't how vanilla does it, the different great house sets representing cultural differences. Regional/cultural building sets seems to be the way to go, and we can always modify them to a smaller degree, like having different textures and unique meshes for certain buildings as well as windows and doors. IMO the GC set should cover Anvil and Sutch, with Stirk using the "modified" but recognizable version (if Brina Cross wasn't built already, I'd have used it there as well. ). We could go sort of the the same route for Kvatch, with some differences of course, like a retexture and a different wall set. The Kvatch set should be more grey, and have more pronounced stonework, but it could mostly use the same meshes. Then we would need a southern Colovia set (Skingrad, Sarchal etc.) and a northern Colovia set (Chorrol, Bruma, Artemon). The Northern set could have some minor variations, with the Chorrol set being almost exclusively wooden and the Jerall mts. set using more stone and Nordic carvings. These three sets could be variations on the same root theme, mostly using the same meshes, but with slight variations. These sets can also be used (with fortifications) to build the Colovian manors found in the highlands. EDIT: I should note that the plan outlined in the above topic is not up-to-date, especially the wall talk. Normally I wouldn't interject here, since I'm not a member of the team, but since you're considering using Redguard elements in Sutch, have you considered contacting TheGreyWizard from the Stros M'Kai project? He sent me some new project files last week and the assets in them are pretty fantastic, he's done a lot to really revamp a lot of the Redguard architecture since the project was first announced back in March, particularly with regards to walls, gates, and bridges. I'm fairly certain TheGreyWizard would be up for resource sharing, I have his email address if anyone would like to contact him directly. His models looks very and very nice for me. Not to be rude, but do we know that the assets are 100% his own work? I ask because in those screenshots I can see some vanilla Oblivion textures (the chapel window being one) and that makes me a little nervous. Otherwise, I agree they look great.